Being blessed with children is truly the best gift that a woman can receive, however it is often at the cost of her body. The physiological changes that woman undergoes with pregnancy can cause her to age prematurely. Too often women raise their children to one day look into the mirror 20 years later and not recognize the woman looking back. Nowadays women have the option of maintaining themselves to reduce the deleterious effects of pregnancy. The common treatment known as the “mummy makeover” traditionally refers to the surgical treatments of tummy tuck (abdominoplasty) and breast lift +/- implants. Many women however do not want the scars of treatment, the 6 weeks of downtime or the excessive costs of surgery. Others don’t want to have surgery until they are sure that they will not have any more children. For women who want a “non-surgical mummy makeover” which will not have any impact on future pregnancies, or just want a bit of maintenance there are a number of options depending upon the concern. Lets look at the common unwanted aesthetic effects of pregnancy on the female body and what can be done. Loose skin from rapid weight gain and loss is a result of the inability to make collagen fast enough to compensate for the growing baby. Young women naturally produce collagen rapidly and they usually tend to get through pregnancy with less damage, whilst older women and those who are genetically poor collagen makers, get crepe paper like skin. 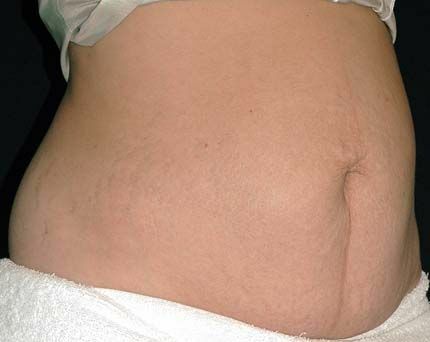 This is usually seen on their stomachs and breasts as stretch marks. If this is severe, or if the muscles underneath have become damaged from the pregnancy then surgery is the best option. If damage is mild to moderate, or an improvement only is desired then the non-surgical options of Thermage CPT or medical rollering are great choices. Stretch marks themselves are in fact a form of scarring. They can be improved but never fully removed unless the damage skin is cut out. Spider veins on legs are another common complaint post children and are the result of pressure of the baby causing backflow of blood returning to the heart. This blood pools in the legs and creates unsightly small purple-red veins. Sclerotherapy can easily treat these. Those will larger varicose veins need a specialized treatment. Many women experience deposits of fat that can’t be removed by simple exercise despite losing their “baby weight”. 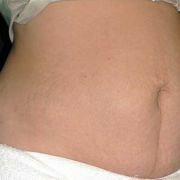 This fat is especially seen in the abdomen and hips. The only true proven way to get rid of it is liposuction. The newer techniques of tumescent liposuction make this safer and more affordable with faster recovery times. This means mums can get back faster to the serious business of focussing on their children. Please note that liposuction can not fix the damaged skin of pregnancy (as the before and after photos show) but it can de-bulk a fatty area and give back a leaner, curvier looking figure. Mums who have damaged their abdominal muscle and who want a completely flat stomach again, or those with severely stretched skin wanting to wear a bikini will need a tummy tuck. It is important to note that it takes the body 6 to 9 months to stabilize after childbirth and some treatments need to wait this time before being performed. Some procedures must also not be done whilst lactating. 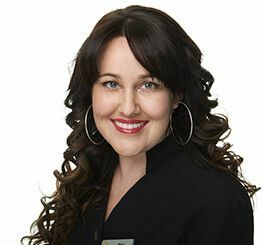 Our doctor is highly experienced and skilled in cosmetic medicine and she will be able to provide individual assessments to help make you a “Yummy Mummy” and the envy of every parents group.